Featuring: Bud Abbott, Lou Costello, Lon Chaney Jr, Bela Lugosi. Director: Charles Barton. I'll always have a soft-spot for Abbott & Costello. When I was a kid I'd always watch their movies with my parents. Before you start wondering "damn how old is this guy?" and feeling sorry for my poor grandson that must maintain not just one, but two, blogs for this old fart that probably thinks googling is something he does in his depends, I'll tell you I'm still only 28. My parents used to rent these movies when I was a kid, probably because they were feeling nostalgic. Now that I'm too old for trick-or-treating I'm feeling nostalgic, too. 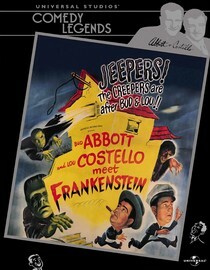 So I was happy to see this classic gem, Abbott & Costello Meet Frankenstein, was streaming on Netflix. Not only do you get a great horror/comedy with the classic duo of Abbott & Costello, you get Bela Lugosi and Lon Chaney, Jr. reprising their classic roles as Dracula and The Wolf Man respectively. The plot is cheesy, the special effects are corny and the plot is silly. But, the brilliant chemistry and comedic back and forth between Abbott & Costello make me cherish this movie as much as I did when I was a kid. Click here to add this movie to your Netflix queue. Why is it in your queue? Nostalgia. Is it artsy? Nope, just funny. Best thing about the movie? The great one-liners and the way Costello acts when he is scared. What mood should I be in to watch this movie? A silly Halloween nostalgia kinda mood..